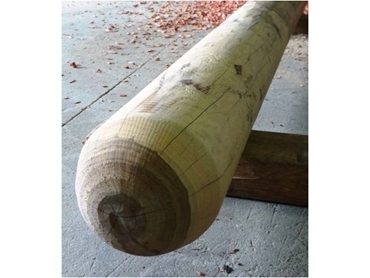 Available from Norwood Products , new Norwood Cypress Pine Rounds are an attractive, long lasting, natural replacement solution for areas where the use of CCA treated pine has been disallowed. Norwood Cypress Pine Rounds provide a solution for organic horticultural purposes because they contain no chemical treatment yet still have the high natural durability that means they will give many years of reliable, natural service. Norwood Cypress Pine Rounds are also a natural solution for children’s playgrounds materials, and for structures in parks, schools and around waterways where chemically treated products are not wanted. These Cypress Pine rounds are the ideal product for replacing treated Pine bollards, which in March 2006 were disallowed from use in children’s play equipment, domestic patios, handrails and applications where human contact is made. Norwood Cypress Pine Rounds are available in 100mm, 125mm and 150mm diameters and up to 3.6m in length.